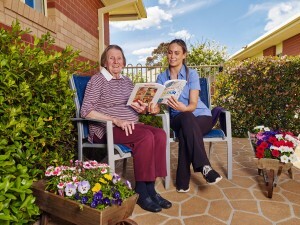 Cooinda is a not for profit, for mission, community owned aged care facility, established in 1969 by community minded people and members of service clubs. Cooinda Village has a proud history of providing excellence in individualised care to Benalla’s older people and their families. Today, Cooinda employs over 100 local people and is also a significant financial contributor to Benalla, North East Victoria. We are an award-winning provider of independent living accommodation, home care and a range of residential care services, including community support and dementia. View Cooinda Fast Facts 2018 here. Our residential accommodation offers large individual rooms with private ensuite. We also have outdoor bbq areas, a sensory garden and large activities rooms. We play an active role in the Benalla community life through our events and contribution to local programs. Our experienced team choose to work at Cooinda because of it is friendly, welcoming and caring. We empowered our people to find better ways of caring, in collaboration with one another, individuals and families. Surprising, creative and playful, we host an ever-changing program of lifestyle activities. We see the potential in everyone to enjoy life.